In 1926 Paul’s first job out of college was with the premiere electronics company in the world – General Electric. Edison was still involved. While Paul started out designing radios, it wasn’t long before he asked to be transferred to the locomotive division. 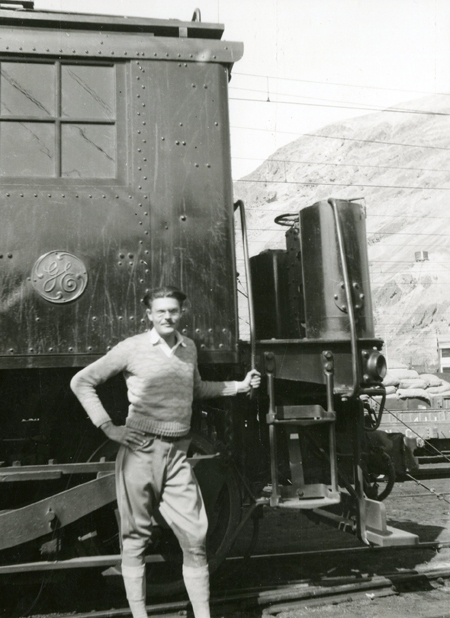 Having been in the ranks of the employed for only two years, Paul saw the opportunity to work on a railroad. GE was preparing to ship several locomotives to the Anglo-Chilean Consolidated Nitrate Corporation’s operations in Tocopilla, Chile. As Paul would say: “That was like waving a bull in front of a red flag”. GE gave him the green light and Paul received his letter of offer dated March 5, 1928 for the position of “Junior Electrical Engineer” for a period of three years. Regardless of whether that title was a hard pill to swallow, Paul jumped at the chance to “work on the railroad”. Fast forward to 1953: Paul wanted to model a steam engine similar to one that ran from Lordsburg, NM to El Paso, TX in 1917. This happens to be the year after his father passed away, and could have been the train that moved Paul and his mother to El Paso. He studied this locomotive for over 20 years, as partially reflected in the posted documentation. He never completed the “cosmetic portion” of his model, but the “running gear” was built entirely by hand, down to the pistons, rods, linkage, and wheels. Apply compressed air to it and it works! In the 1970’s Paul devoted a lot of time to modeling electric locomotives in similar engineering detail, such as prototypic weight distribution per axle and live catenary power. These trains would run on tracks mounted to the privacy fence around his swimming pool, and were known to deliver cans of beer to his guests.